Tom Epperson’s third novel, Roberto to the Dark Tower Came, will be published by Meerkat Press in May, 2018. Roberto lives in a repressive right-wing country, working for a progressive newspaper dedicated to exposing injustices and corruption. Early one morning he receives an anonymous call informing him that he has ten days to leave the country, or he will be killed. Roberto takes the threat very seriously, as many journalists in his country have already been killed, and forms a plan to join his fiancee, Caroline, on an idyllic Caribbean island where she’s gone to care for her dying mother. But over the next few days, as he says goodbye to his family and friends, he gets tipped off to a huge story: the army and the paramilitaries are about to launch an offensive to crush a rebellion in the north, which will result in tens of thousands of innocent people being murdered or displaced. Even though his life is in danger, Roberto can’t resist the story. So instead of fleeing the country, he enlists his photographer best friend Daniel, and together they journey north, hire a young guerrilla named Lina as their guide, and begin what turns out to be a nightmarish journey into the jungle. As Roberto and his companions move through a landscape of intense beauty and phantasmagoric violence, Caroline seems increasingly far away. But Roberto presses forward, unknowingly heading toward a confrontation with an evil darker than he could possibly have imagined. Tom Epperson made trips to Colombia and Peru and traveled along the rivers and into the jungles of the upper Amazon basin to research ﻿Roberto to the Dark Tower Came﻿. 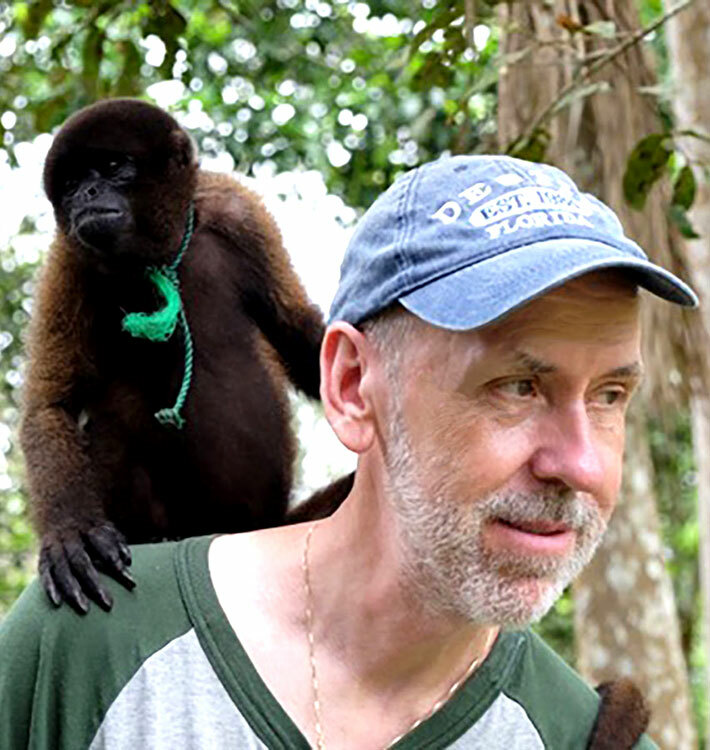 In the Peruvian Amazon with Pepe.